Hands up whose kids have ever gone Picasso rouge and drawn on the living room walls, or crayoned on the floor, or painted on the sofa? Of course we want to encourage the artistic natures of our children but it is hard to keep up with fun, engaging ways of doing this. Pens and paper are age old, simple and cheap activities, but at six years old this does not keep my tornado of a son entertained for long. A versatile alternative to a dry erase marker and cooler older brother to the original powder-all-over-the-carpet chalk. 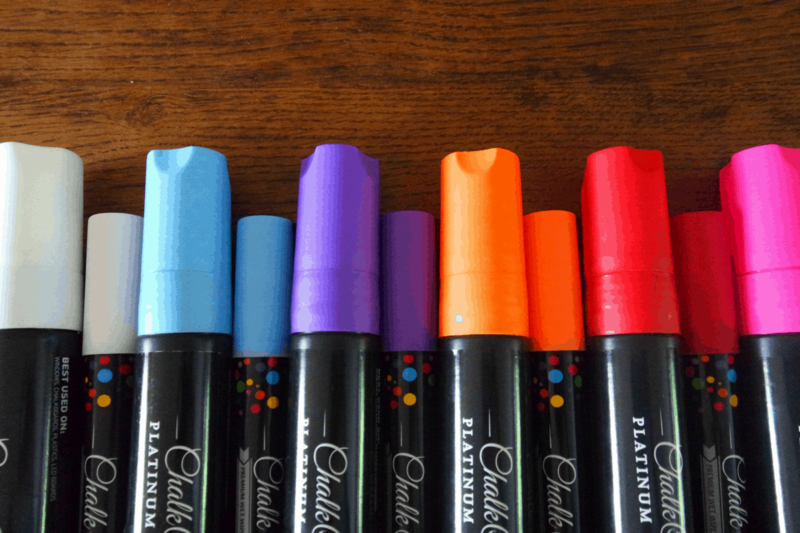 Chalkola markers have created liquid, non-toxic, odour free markers designed for non-porous surfaces such as glass, plastic, blackboards and mirrors. They advise that you test a small patch on blackboard paint as walls are porous and they may be difficult to remove. Since my windows were in need of a clean I was brave and let the littles loose on the front of the house. It is advisable that an adult help activate he pens, you need to shake each one for 30 seconds then pump the nib until the ink flows, which if you have smaller children they can get impatient. This only needs to be done once. Of good quality, none of the pens dripped or ran. I would encourage nervous parents to have a damp kitchen towel on hand. For more detailed drawing or lettering, you can use cotton wool or ear buds to erase mistakes. The lids can easily be pulled off so ensure they can be stored out of little fingers reach. I would not consider them suitable for children under two. Offering a fantastic range of shades, the pens are washable; the ink comes off hands easily but I have yet to test how easily it is removed from clothing. When light shines through colours are vibrant and long lasting, you can rub your hand over the pictures and they stay intact. If littles are drawing on the inside of windows on the glass I would encourage parents to be careful on a sunny day, so children do not damage their eyes. We tried out the 6 and 15mm nibs, these pens can all be used to make bold lines, wide lines, thin or fine lines. Give clear instructions to younger children. The markers are easy to wipe clean with a damp cloth or window cleaner but ensure they are supervised so don’t go rouge and get creative with the wallpaper. After a few hours use the markers still flow as well as when first opened. Encourage children to wait for the colour to be touch dry (in a few seconds) before using the next as otherwise the nibs will be rainbow and colours get smudged together. It’s such a relief to not have to tend to spillages and let the children independently play. Notes. For doing maths homework and writing phonics on mirrors and the shopping list on the fridge. Art. Creating beautiful birthday card designs on black paper. Labels. For naming our jars in the kitchen. Personalising our drinks glasses, and slate table mats. Festive. Perfect for adding holiday decoration to home windows, a wreath at Christmas, egg for Easter and hearts for Valentines. Decoration. Think outside the box and get crafty, doodling on beach stones to picture frames. What ways have you gotten creative with these pens? Any other craft lovers used them-what do you think?